As mobile technology grows, so does the need for organizations to keep up. However, there are certain challenges enterprises face as they adjust to meet the increasing technological demands. Wireless connectivity. As more enterprises adapt to the mobile-cloud with a Bring Your Own Device (BYOD) policy, wireless service is no longer an optional addition to the wired network. In today’s environment, CIOs need to incorporate wireless technology into the design of their infrastructure and treat it as the primary source for conducting business. Visibility. The number of mobile devices connecting to enterprises is growing at a rapid pace. To keep systems running without disruption, IT teams need visibility into where users are connecting on the network and to predict issues before they arise. Security. In order to enforce proper security measures on the network and connected mobile devices, IT needs to understand the infrastructure and processes put in place. It must be able to implement the right set of tools to quickly translate complex corporate security policies and stringent compliance requirements without wasting valuable time and resources. Aruba optimizes for the digital enterprise and provides solutions for these common mobile challenges through enhancing wireless systems, the ability to predict issues and securing the network through policy management implementation. More than 75% of people enrolled in higher education courses use a mobile device such as a smart phone or tablet to help them learn. More than 50% feel technology connects them more personally with their peers and staff members. The average student owns seven tech devices including cell phones, tablets, smart watches and more. More than half of students connect at least two devices to a network at a time. Like other organizations, higher education institutions must consider ways to protect their students, staff and information. 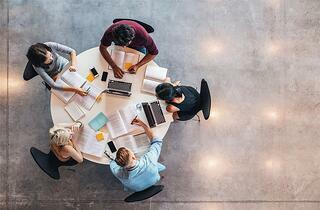 Aruba has developed a mix of solutions specifically for colleges, universities and other educational establishments. Mobile technology is here to stay and will continue to improve how enterprises conduct business. If you need help putting together a mobile solution for your organization, WEI can design a custom plan to fit your specific requirements.